Hockey Plumber: Welcome Back Hockey Plumber! Well, we have been on Holiday hiatus long enough. 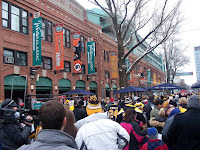 The Hockey Plumber was in attendance at the 2010 Bridgestone Winter Classic, and the event was spectacular. I am sure that most of you either were there, or watched on NBC and will agree that the game was exciting enough on its own merit. The Bruins fans were rallied by Denis Leary and friends just in the nick of time as the home team scored to tie it up and then won in overtime. 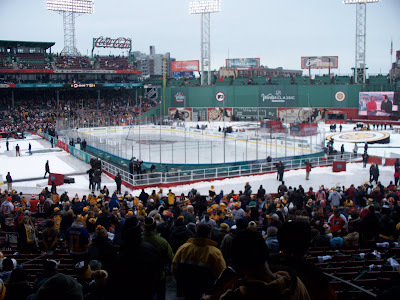 Having never attended an organized outdoor game before, like myself, I think that most of the people in attendance were surprised at the quiet of the game. In the open air you could hardly hear a whistle, or even the clanking of sticks on a face-off, let alone the rattle of a pass off a stick blade or a shot being fired on net. Therefore, the 36,000 plus witnesses enjoyed the contest in silence with only the roar of the crowd, or the interruption of the festivities to guide us! It was a grand event in a historic venue that I will not soon forget. Sorry for the delay, but we are back!! !